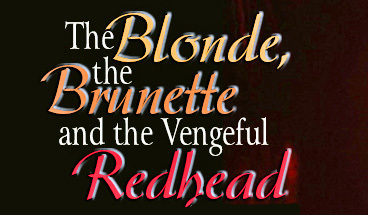 "The Blonde, the Brunette and the Vengeful Redhead"
With "The Blonde, the Brunette and the Vengeful Redhead"
Award-winning actress Karen MacDonald, certainly one of the busiest talents in town this past year, will star in the regional premiere of "The Blonde, the Brunette and the Vengeful Redhead" by Robert Hewett at Merrimack Repertory Theatre. Directed by OBIE Award-winning director Melia Bensussen, performances are set for April 22 – May 16. In "The Blonde, the Brunette and the Vengeful Redhead," a cheating husband, a meddling neighbor and a dropped ice cream cone combine to shatter Rhonda Russell’s quiet, suburban life. Seven very different characters each offer their own perspective of the day Rhonda went berserk – all played by a single gifted performer. It is described as a captivatingly brilliant tour de force about loss and ultimate redemption. Karen MacDonald is returning to Merrimack Rep for the first time in over a decade, having performed in more 70 productions at American Repertory Theatre. She first appeared on Merrimack Rep’s Liberty Hall stage in 1989 as Elvira in "Blithe Spirit," then in "Frankie & Johnny in the Clair de Lune" and later in the 1991 production of "A Moon for the Misbegotten." She won an Elliot Norton award for her performance in Merrimack Rep’s 1995 production of "Who’s Afraid of Virginia Woolf." Boston audiences have most recently seen her in "All My Sons " and "A Civil War Christmas" at the Huntington Theatre Company, as well as in "boom" at New Repertory Theatre. Melia Bensussen, chair of the performing arts faculty at Boston’s Emerson College, is returning to Merrimack Rep, having previously directed "Something in the Air" and "Aunt Dan & Lemon." "The Blonde, the Brunette and the Vengeful Redhead "is the first of Robert Hewett’s plays to be produced by Merrimack Rep. A native of Australia, and an honors graduate of Flinders University, Hewett began his career in the theatre as an actor. He worked extensively in theatre, film, television and radio before switching to writing. His first play, "Just...One Last Dance," premiered at Auckland’s Mercury Theatre in 1980. The Melbourne Theatre Company produced his second and highly acclaimed play, "Gulls," in 1983. "Gulls" received the Green Room Award for Best Play, and shortlisted in the inaugural Premier's Literary Awards. "The Blonde, the Brunette and the Vengeful Redhead opened to acclaim at The Stables in Sydney in February 2004 and toured Australia for 4 years. For information and tickets, stop by the box office in Liberty Hall, 50 E. Merrimack Street in Lowell or call 978-654-4678.